In this example, the name of the branch is improve_install_article and the upstream/2.7 value tells Git to create this branch based on the 2.7 branch of the upstream remote, which is the original Symfony Docs repository. Step 7. Everything is now ready to initiate a pull request. Go to your forked repository at https//github.com/YOUR-GITHUB-USERNAME/symfony-docs and click on the Pull Requests link located in the sidebar. In this example, the base fork should be symfony/symfony-docs and the base branch should be the 2.7, which is the branch that you selected to base your changes on. 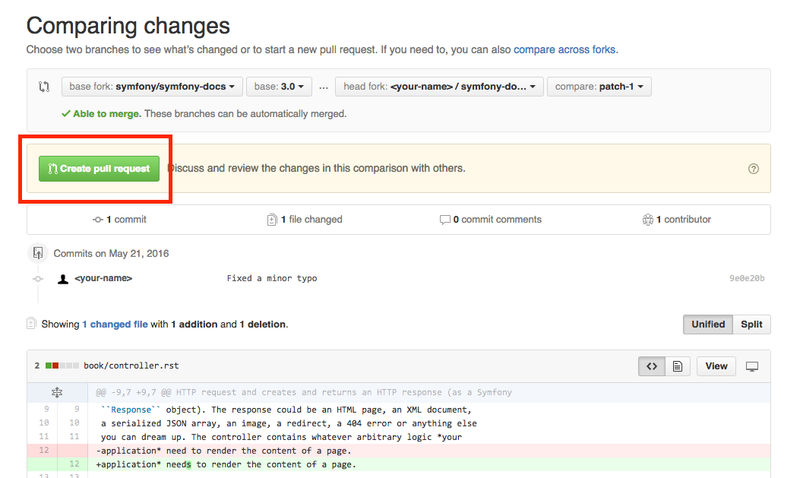 The head fork should be your forked copy of symfony-docs and the compare branch should be improve_install_article, which is the name of the branch you created and where you made your changes.